Recruiting Graham Dorrans would land Rangers a player his Norwich City team-mate Steven Naismith believes could have propelled the Carrow Road club back into the English Premier League last season had he not being sidelined with a knee problem for three months. Reports suggest the Ibrox club are preparing to lodge a £1.2 million bid for the 30-year-old midfielder, pictured. A £700,000 offer by Rangers for the former West Bromwich Albion and Livingston player was rebuffed last week but Naismith is surprised Norwich are willing to part with him. 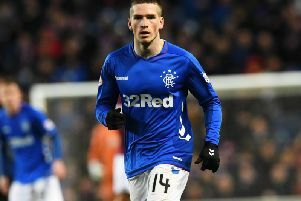 “The club is in a transitional period, sacrifices may have to be made and he might be one of them,” the former Rangers attacker said. “For me that was the biggest miss of the season for us with his injuries. He plays with a calmness. Our best performances were when he was in the team. When you are a forward and you are playing with Dozzy, you know you can find the wee pockets and he’ll deliver that pass, he’ll not play safe and knock it side to side. Naismith knows that Dorrans is keen on an Ibrox switch but the discussions they have had about life at Rangers have concentrated on what it was like in his five-year spell that was ended by the 2012 liquidation.